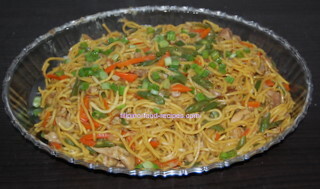 Pancit Canton, one of the popular Filipino noodle dishes, uses a kind of dried egg noodles called Canton, that is made from wheat flour and coconut oil. It has an distinct taste and aroma brought about by the coconut oil, that makes it distinguishable from any other yellow egg noodles found in the market. 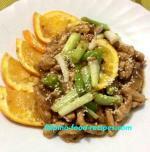 The cooking process that I use is almost the same as that of the Pancit Bihon Guisado. The only difference is that I don't soak or drizzle hot water on the Canton before cooking them. They tend to lose their deep yellow color and the water washes off some of the starches and the distinct canton flavor. 1 Saute the garlic and onion. Add the chicken/pork, soy sauce, carrots and saute for 2 minutes. 2 Add the chicken broth and Knorr chicken cube. Bring to a boil. 3 Gently add the noodles to soften in the broth. Do not press or the noodles will break apart. 4 Mix in the green beans, cabbage and the cornstarch dispersed in water. 5 Stir gently until the noodles are cooked and the water is fully absorbed. 6 Put on a serving dish topped with green onions and out slices of lemon on the side. Optional ingredients you can add : Chinese sausages, fish balls, shrimp and squid. If you want to add shrimps or squids, put them on Step #4 so it will not get overcooked. You can substitute Snow Peas(Sitsaro) for the green beans for less preparation time. For a Chinese style Lo Mein taste, replace 1 tablespoon of soy sauce to 1 tablespoon of oyster sauce, added in Step #4 with the cornstarch mixture. Then, on Step #5, put 1/2 cup of bean sprouts (togue) and finish off with a drizzle of sesame oil.